McDonald's (MCD) has been in the national press of late with notes of franchisee problems. Many understand that McDonald's is partially a real estate story, and is one of the three primary MCD revenue streams. Being in real estate in the early years presented an understandable story to the lending community, that didn't understand $.15 hamburgers. It also was a way to control the franchise structure via a lease, and to take an ownership interest to smooth out early startup losses. Over time, MCD corporate earnings have been partially reliant on the real estate margin. Early histories on MCD noted an 8.5% total restaurant rent goal and a MCD corporate real estate margin of 25-30%. It's risen a lot since those days. Rent expense has generally increased worldwide, but McDonald's rent margin-its markup--has also. See the following extracts taken from the MCD last 10K filings. The McDonald's rent margin is now almost 84%. This is the function of several factors, including higher store revenues over time, hitting a rent overage threshold that goes as high as 18% of revenue, as well as rent concessions that the landlord McDonald's realized that it did not pass on to the franchisees. McDonald's rent per franchise lessor site is calculated as above, at over $292,000 per unit, up 26% from 2007. We don't have the exact breakout of McDonald's franchisee revenue for the lessor stores to run a rent percentage, but it rent has to be up. Rent revenue is up more than the number of franchisees, illustrating the issue. McDonald's is 81% franchised. 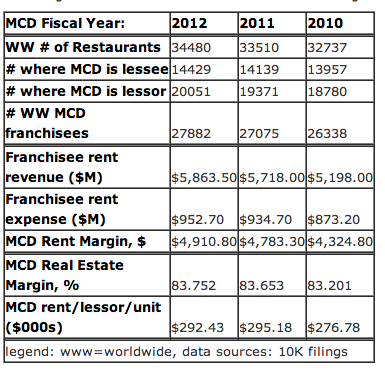 The franchise economic model has to work for MCD to expand. Restaurant economics were built on 6-8% rent. But the data above suggests actuals are higher. The missed opportunity of the McDonald's model is that corporate could lower franchisees rents to offset the price discounting it does to hit the Street's same store sales goals-but to do so, it would have to find corporate G&A savings elsewhere to offset the rent decline. That is not on the corporate menu at this point. This page is an archive of recent entries in the McDonald's category. Meineke is the previous category. NAPAA is the next category.